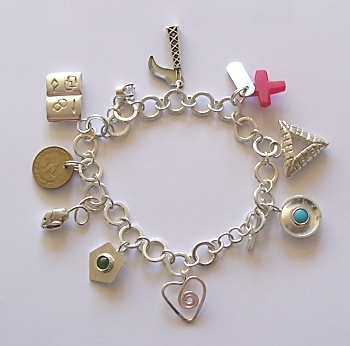 A charm bracelet handmade by me at a week long jewellery course. The theme of my bracelet is '2006' and all the charms are related to events in my year. - A mouse made using wax carving and casting, then his tail soldered on. - a red cross carved from perspex, along with a tag cut from silver and then stamped with 2006. - A book made using wax carving and casting, engraved with Hobo symbols. - A textured and domed piece of silver I soldered a bezel to and set a Turquoise stone in. - A textured pentagon shaped piece of silver I soldered a bezel to and set a green stone in. - A triangular patterned piece of silver that was made using wax carving and casting. - A heart formed from wire and hammered. - A coin I brought back from Thailand. - A bought charm of the John Hancock Centre I brought back from Chicago after going to the Bead and Button Show.